The Chinese New Year holiday is approaching again, which means it’s time to consider planning for the first quarter of 2014. Chinese companies close the last week of January through at least the first week of February. Some shut down longer. Adding to this is that more than two hundred million Chinese workers on the East Coast migrate back home to the inland cities during the CNY; many take a month or even longer to return. This means it takes factories at least a month to return to full production capacity; February is essentially lost for production or making shipments. If you have product that needs to be shipped before the shutdown in January, we recommend that orders are placed by November 15 to be safe. Many factories stop putting new orders in their production schedule after January 10 because their production schedule is packed with last minute shipments. We have a booth at the Fabtech show in Chicago next week, which runs November 18-21. I’ll be there Monday through Wednesday. If you happen to be in Chicago next week, please stop by and say hello. The show is held at the McCormick Place convention center. Last month, China signed a 57 billion dollar currency swap agreement with the European Central Bank. This will allow European businesses to trade Euros for Yuan, cutting the dollar out of more international trade. This is another step towards making the Yuan an internationally traded currency. I wish our elected body of government would do something serious to tackle the debt problem. Every time we come close to defaulting on our debt it gives the world another reason to doubt the future solvency of the U.S.
No, I’m not talking about the Borg Cube from Star Trek. 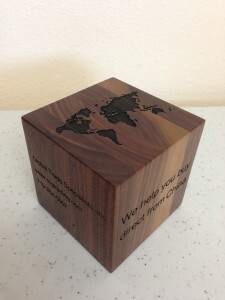 We had some 3” cubes made from solid walnut with a world map image on the top made up. I’ve always loved good wood work, and these look great. If you want one and live in the U.S., please email me with your address and we’ll send one out. We have a Facebook page for Global Trade Specialists up. At the Facebook page we’ll be making weekly posts with updates, news, points of interest, videos, and more. We already have one video up along with a cool picture of Queen Victoria Harbor in Hong Kong. Ever since the U.S. government nearly defaulted last month, the dollar has been sliding against the Yuan again.